This is no ordinary Bessacarr 496 – in fact, it’s a special edition Hi-Style, exclusive to Midlands dealer chain, Lowdhams. The Hi-Style is endowed with more than £3000 worth of additional equipment, despite costing just £1000 more than a standard 496. Externally, this latest model distinguishes itself most obviously by the gentle roofline hump just aft of the cab in lieu of the old overcab moulding; you couldn’t call it streamlined, but it’s a vast improvement nonetheless, especially on this long wheelbase; it balances out the proportions nicely. The cassette toilet hatch, mains hook-up point and water filler are confined to the offside, so those lazy evenings spent under the huge nearside awning won’t be spoiled by trailing leads or brimming loo cassettes heading for disposal. The gas locker next to the habitation entrance door is large, but usefully low to make loading cylinders that much easier. It’s good to see the Winter Pack (which comprises heated water tanks and insulated plumbing) fitted as standard, but surely a motorhome’s capacity for fresh water (90 litres in this case) ought to be matched by its capacity for waste; the Hi-Style’s grey-water tank can hold just 68 litres. Nevertheless, exterior equipment is very good on the whole – the benefits of the full-length awning and colour reversing camera are plain to see. Power comes from the Fiat Ducato’s proven 2.3-litre turbodiesel ‘four’ allied to a standard-fit six-speed manual gearbox, although you can upgrade to the desirable ComfortMatic auto transmission at extra cost. It has 130bhp and measures 7.75m long, 2.38m wide and 2.82m high (25’5” long, 7’9” wide, 9’3 high). The MTPLM is 4250kg and the payload is around 930kg. Elsewhere the Hi-Style pack brings with it a host of additional equipment, including cruise control, cab air conditioning and a stereo upgrade that comprises a fully integrated DAB radio, a CD player, a touch-screen sat-nav and Bluetooth phone connectivity. You enter the 496 via the forward lounge. The Pullman dinette offers four fully belted travel seats, doubles as a spacious dining area and converts – with a degree of cushion flipping – into a decent-sized double bed. The settee opposite is big enough to accommodate two further adults, so it seems just a little odd that the passenger cab seat doesn’t swivel to add in another seating position. In day mode, this is undoubtedly the place to be, offering as it does simply colossal lounging and dining space. Large windows and ample lighting keep the area well-lit by day or night, too. Unfortunately, the palatial lounge does encroach on the amidships kitchen. There’s nothing wrong with the kit on offer (dual-fuel hob, separate oven and grill, microwave and good-sized fridge), but worktop space is at a premium and rescued only by a fold-up extension flap by the door. Cupboard space is just as tight. The locker to the right of the microwave passes the all-important cereal-box test with ease, but the one between the cooker and fridge is quite narrow and dominated by the cutlery drawer. of the bed stretch taut to protect occupants from the surrounding cabinetry and the bed can be fixed at almost any height – Swift even provides a ladder – if the ‘downstairs’ bed is in use. If not, it can drop to a suitably low level, once you’ve removed the settees’ seat backs. The rear double bed is the biggest in the Bessacarr, stretching the tape measure to 2.11m by 1.67m. It’s not fully four-square (the nearside single is noticeably longer than the offside equivalent), but it is still enormous, again with the rearmost backrests removed. Opposite the kitchen is the washroom, and as with the kitchen, the spacious lounge compromises the space available for the washroom. 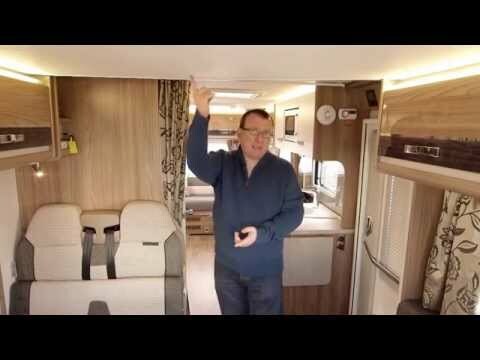 As with many motorhomes of this type (which spend most of their time on full-facility sites), this is an all-in-one affair, but the offside rear wheel arch truncates the shower tray, and the bi-fold door only partly succeeds in shielding the toilet from shower overspray. Storage space here is good, though, and it’s well-lit. There's plenty of storage under the seat boxes and the cupboards either side of the microwave in the kitchen are big enough for your crockery and cereal boxes. Storage in the washroom is surprisingly good. There's £3000-worth of extra equipment in this dealer special, compared to the normal Bessacarr Hi-Style. That's a real bargain, since the purchase price of £51,890 OTR (2015) is only £1000 more than the motorhome it's based upon. Low-line bodywork and a drop-down bed make the latest 496 a contender in the premium family motorhome market. Lounging space and the six sleeping berths are exceptional, but the washroom and kitchen disappoint slightly. This dealer special is made exclusively for Lowdhams by the Swift Group and you can see the Bessacarr Hi-Style 496 either at Lowdhams in Crosland Hill, Huddersfield, or the branch in Gunthorpe, Nottingham.